Age Group: 3 yrs and up. 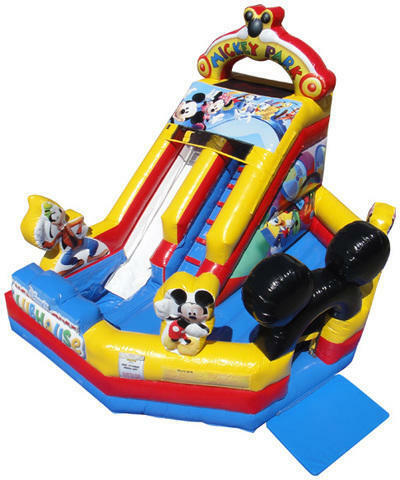 THE MICKEY PARK SLIDE WITH BOUNCING AREA. This Mickey Park Water Slide is a fantastic inflatable that will liven any child's party. This Disney-themed bounce house is adorned with the lovable characters Mickey and Goofy, and is perfect for entertaining toddlers ages 3 and up. You can keep your children cool on these really hot days with this versatile 16' x 14' colorful moonwalk and it's 7' slide.